Space shuttle Atlantis atop the crawler-transporter makes its way up the steep incline to Launch Pad 39A on Oct. 14, 2009 for a planned Nov. 12 launch. Here's something to tweet about: NASA has invited some Twitterfollowers to view the November launch of space shuttle Atlantis in personduring a NASA "tweetup." The tweetup, or meeting of twitterers, will be open to thefirst 100 people who sign up on a NASA Web site to attend the plannedNov. 12 liftoff of Atlantis from NASA's Kennedy Space Center in Cape Canaveral, Fla.
"This will be NASA's fifth tweetup for our Twittercommunity," said Michael Cabbage, director of the News Services divisionat NASA Headquarters in Washington, D.C. "Each event has provided ourfollowers with inside access to NASA personnel, including astronauts. The goalof this particular tweetup is to share the excitement of ashuttle launch with a new audience." NASA has embraced the microblogging service, and a growing cadreof astronauts is now keeping in touch with the public through Twitter. Twospaceflyers currently onboard the International Space Station - NASA astronautsJeff Williams ("Astro_Jeff") and Nicole Stott ("Astro_Nicole")- post updates to the site. 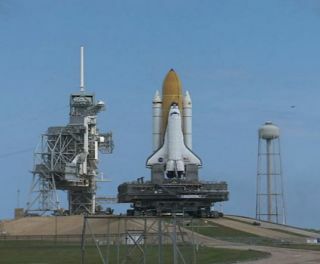 Atlantis was rolled out to Launch Pad 39A today inpreparation for next month's launch, even though NASA is still unsure ofexactly when the spacecraft will fly due to scheduling constraints. Despite theuncertainty, the agency is forging ahead with plans for the tweetup, scheduledto run on Nov. 11 and 12. During the event NASA Twitter followers will take a tour of Kennedy Space Center, view the space shuttle launch and speak with shuttle technicians,engineers, astronauts and managers. There will also be a meet-and-greet sessionwhere participants can mingle with fellow "tweeps" and the staffbehind the tweets on @NASA. Registration for the event opens at 12:00 p.m. EDT (1600GMT) on Friday, Oct. 16 at http://www.nasa.gov/tweetup.The first 100 people to sign up will be given tickets, and an additional 50people will be put on a wait-list.